Sounds like a fun day. I love finding good secondhand stuff, and who could resist that chicken? I also love the little dog in tutu. Good for you and the magic cd too. Oh, and I worked in a Fotomat kiosk way back when! I loved it since it meant no fuss much of the time. Really, you worked at a Fotomat? Ah, I miss those places! In truth, I miss that whole aspect of handing over a roll of film, wondering how many pictures would develop, feeling dang lucky if I got half (I was always a lousy photographer!). Sounds like the perfect day. Not sure you could have made it any better. Well, you could somehow have brought cats into the story – that’s about the only thing missing, a nice kitty picture. I’ve heard of cat cafes and always wanted to visit one, but sadly there are none in Phoenix. The ones I read about are places where all the cats are available for adoption. Wouldn’t that be great? Stop in for a bite of lunch, come home with a kitty. I want to dine at a pet friendly restaurant. My sister has two King Charles spaniels and they are definitely sister divas! Very cute post. I’m sure those cropped pants must have been marked wrong! I think those spaniels are adorable, but it seems like they know it, don’t you think? I’m sure they do! Oh yes her little one is like 10 pounds and would be happy if her little feet never had to touch the ground! Ever to my surprise or maybe not, you talked about God’s perfect creation, the Golden Retriever… nothing but pure love. My last golden (Zach) died about 4 years ago and I still miss him. I did a blog post on him, I’ll look it up and send it. I’ve never been so fortunate as to own a Golden Retriever, but one day I’m sure it will come to pass. They melt my heart every time. Sounds like daughter is a chip off the old block. And the German Shepard? He was probably less perturbed by the Shih Tzu than by the prospect his human might be inspired to make him wear a tutu. Wow, Butch really dodged that bullet! You area good Mumma, of that there is no doubt. Wonderful day for you both to spend together. Boohah! That was a day of days and I am envious in an entirely benign way. Good things shall come for the righteous and those that accept that mislabeled pants that fit perfectly are manna from Heaven even though the celestial are a little haphazard with their sizing. Too much lovely for me to pick what to pinpoint (though Ryan has my vote too and I would love to read your daughter’s play when it is penned) so I’m going for the Upper Bucklebury in relation to the Kings Charles Spaniel angle. This is because Bucklebury was a village near where I grew up with a wonderful huge wooded common that we used to walk in. Much later my sister-in-law would teach a child from that place at the snooty Prep school she taught in. That child grew up to marry Prince William, heir to the throne of England (after the Queen and Prince Charles pass on) …. that dog name just spoke volumes to me – it threw me back years to and England I have long left and reminded me of days with my own mother. Happy happy days. Words, you see. So powerful in the hands of a skilled writer. Which you are. Very. Oh wow, that must be why Upper Bucklebury called out to me in the writing of this post! It’s too perfect for words! Seriously woman, your near misses of direct contact with notable personalities impresses me to no end. I love them even more because they’re near misses, and that’s the truth. The image I’m getting of you holding a parasol, trailing your fingers along the ivy covered stone wall, is perfection. It shall carry me through the day splendidly. First, I must have the Checkered Chicken. Please don’t judge me too harshly if it vanishes from your environs. Okay, first up, about the pink checkered chicken. I’m sad to say I am no longer in possession of it. When I first got it, it entered our family’s “white elephant” exchange at Christmas. For several years it changed hands, usually with a bottle of wine to lessen the blow, and whoever got it would display it in their house proudly until the next year. We had it a couple years in a row! Then one year it went to someone who liked it too much and we never saw it at the gift exchange again. Sad, but true. Secondly, I have to say I’m a bit embarrassed, but it honestly never occurred to me to ask the magazine women what they were doing. This is why I’m a lousy reporter. I just stay in my seat and wonder. Thirdly, as for the veggie sandwich, they have no burgers or fries on their menu, so greasy fare just wasn’t an option. But their tea really is marvelous. Really! I absolutely love this post! In fact, I think it may be my favorite one yet. Sounds like a fabulous day with your daughter too. 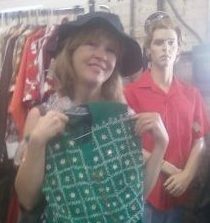 I love shopping at thrift stores myself, especially when there’s ample time and I have no particular item I’m looking for. It is so much fun when you find that oddball thing that you didn’t realize you actually needed-and then you get it cheap! I get a kick out of thrift stores, the quirkier stuff the better!